October is breast cancer awareness month. It is also the start of the Pink Ribbon campaign where many people wear pink ribbons to increase the awareness of breast cancer. National Breast Cancer Awareness month was created in cooperation of the American Cancer Society and a pharmaceutical company that specializes in breast cancer drugs. Breast Cancer Awareness month was started in 1985 and the Pink Ribbon campaign was started in 1991. While breast cancer is a problem in the world and almost exclusively affecting women, it is still possible for men to get breast cancer. In 1996, a pink and blue ribbon was designed to raise awareness of breast cancer in men. Events around the world have expanded to include various charity runs as well as other forms of awareness. One of the most visible is the global illumination. Various landmarks around the world are illuminated in pink lighting marking the start of Breast Cancer Awareness month. It is often sponsored by various corporations and easily picked up by the global landmarks that can adjust their lighting to suit their needs. Some of the more famous examples are the Empire State Building in New York and the White House. Japan is no exception with their own set of illuminations. For several years now, Tokyo Tower has been pink on October 1. I’m not too sure if it has been lit up every day in October, but it has been pink for at least the last couple years. This year marked the official opening of Tokyo Sky Tree. There are several different colours that Tokyo Sky Tree can become and on September 7, Tokyo Sky Tree was lit in 5 different colours. There was blue, gold/yellow, purple, green, and red. The 5 colours represented the 5 rings of the Olympics as it marked 1 year before the vote for who will host the 2020 Olympics. Of course black would be difficult to have so they chose purple to represent black. Today, being October 1, they had another special colour. They lit up Tokyo Sky Tree in pink to celebrate Breast Cancer Awareness Month as well as promote the pink ribbon campaign. 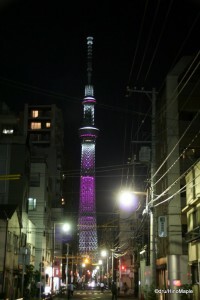 I’m not too sure whether or not they will light up Tokyo Sky Tree in pink all month but it is possible. Hopefully I will know by tomorrow. 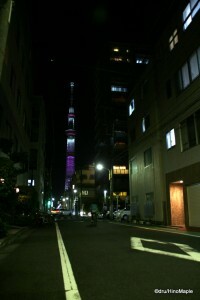 The pink colour showed how versatile Tokyo Sky Tree could be lit. They had a system that was similar to the blue version of Tokyo Sky Tree except they changed the blue to pink. They also added pink crystal lights that sparkled all the way down Sky Tree like a waterfall before turning off. It was quite a beautiful display that was very popular with everyone as I headed home. Hope you all can enjoy the various colours of Tokyo Sky Tree, but let’s not forget the main purpose of this post. It is to help raise the awareness of breast cancer, or rather keep the awareness strong as I feel so many people know about breast cancer already. Update: After the full pink Sky Tree on Oct. 1, Tokyo Sky Tree still has a little pink to it. During the evening illumination, there is a pink ribbon at the upper observation deck. It also has a counter clockwise “flash” rotating around the pink ribbon on the upper observation deck. The lower observation deck should also have a pink ribbon around it, but to be honest, it looks a bit orange to me. 🙁 I am now assuming this will end at the end of October to coincide with the end of the pink ribbon campaign. Note: Today is a special post. This week’s regular long post will be up tomorrow. This entry was posted in Culture, Tokyo and tagged American Cancer Society, awareness, breast, Breast Cancer, Breast Cancer Awareness, cancer, japan, pink, Sky Tree, tokyo, Tokyo Sky Tree by Dru. Bookmark the permalink. The whole tower was pink?! Really? Quadruple drat, I didn’t see it! (University has restarted, so I’m walking around in a fog.) I really hope it wasn’t a once-off. PS: I didn’t see the Olympic illumination either. I’m going to sulk for the rest of the day. Hmph. Yup. Sorry to hear you missed it. Maybe you will be lucky and can see it again tonight. Who knows. Don’t sulk. Only a few months till winter vacation season for you. Updated the post to give more information too. A pink Tokyo Sky Tree? Drat! Yes, it would be fun for a certain someone to stand with the pink Sky Tree decked in her favourite cap and running shirt. I also hear she has these great pink running shoes too.